From yoga and spinning to circuits and supersets, there's no right or wrong way to get in shape. Whatever it takes to break a sweat, right? But let's not leave that sweat on the mats (or that hair in the sink). From the locker room to the weight room floor, when it comes to gym etiquette, there are a few dos and don'ts that everyone should follow. From yoga and spinning to circuits and supersets, there's no right or wrong way to get in shape. Whatever it takes to break a sweat, right? But let's not leave that sweat on the mats (or that hair in the sink). From the locker room to the weight room floor, when it comes to gym etiquette, there are a few dos and don'ts that everyone should follow—fitness karma points guaranteed. Respect the headphones. Singles, feel free to mingle, but when those ear buds are in, consider that fair warning. Ms. Independent is game—for the leg press, that is. Lift a finger. More chores, we know… But returning free weights, medicine balls, and other equipment to their proper place is more than courteous—it might burn a few extra calories, too! Mind the mirror. Leave the lip gloss application, ab adoration, and smizing for the boudoir. Gym mirrors are there for form and safety, so avoid crossing in front of Mr. Military Press mid-set. Get in the zone. The right one, that is. From bicep curls to power cleans, there's a proper place for everything at the gym—and trust us, you don't want to learn the hard way. Share! Sometimes there just aren't enough toys for everyone. Let a stranger "work in." And rather than standing idly by, maximize your time and efforts with a few killer supersets. Easy does it. While every gym has its own policy, most prefer it to be earthquake-free. If that's the case, avoid dropping heavy weights like hot cakes—and leave excessive grunting off the menu, too. Can Athletes Handle More Pain? Don't let it all hang out. While it's unlikely grandma's showing up, Cardio Sculpt is a long ways from Woodstock. To keep things kosher, keep those goodies under wraps. Give some breathing room. It's no secret that cardio can get a little sticky-icky sometimes. So when there's a choice of seven free treadmills, is it really necessary to cozy up right next to Ultra-Marathon Man? Try opting for a solo run instead. Get mobile without the mobile phone. 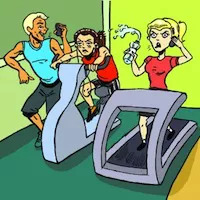 Chatting on a treadmill is a recipe for road kill. Of course there are exceptions, including firing up fitness apps like Runkeeeper or Fitbit to stay on track. Play it straight. Interval training aside, keep the treadmill stunts to a minimum (unless of course you're these guys). No spitting, snot rocketing, or other barnyard behavior. This should go without saying, but spend enough time in a gym and you're bound to see it once. Do not pass go; proceed directly to the hand sanitizer (stank face optional). No disappearing acts. Saving seats was so not fair in middle school—and not much has changed since then. So don't expect that towel, water bottle, or fanny pack (workout fashion 911!) to mean "dibs" on the elliptical. Put hygiene first. While some people are actually allergic to deodorant, for the rest of us, there's no excuse for smelling like those gym socks—everywhere. And no, cologne or eau de anything isn't exactly a quick fix. Groom in private. Flossing, tweezing, and blow-drying anything but the hair on your head is a big locker room no-no. When in doubt, save the iffy stuff for the homestead. Hide the salami. Seriously. Not everyone grew up in a naked home. Lounging, stretching, and chit chatting in the buff might feel fantastic, but not for everyone involved. We all need boundaries, right? Pack it up. Bench hogs, take note: Sneakers, gym bags, laptops, and lap dogs don't all deserve a spot on the bench. During peak hours especially, lock up those belongings to give fellow gym-goers space to suit up. Arrive early. Fashionably late doesn't apply when it comes to group classes. Plan to arrive at least five minutes early to find a spot and settle in without disruption. Stagger. Sun salutations should be PG, so make sure the arms and legs can extend fully—without feeling up your neighbor. Like on public transportation, there's really no excuse for an improper touch. Go with the flow. Class energy matters, so go ahead and chant those Intensati affirmations—but not in meditation class. There's a time and a place for ohm-ing, panting, and screaming out reps.
No peeping Toms! Maybe Tom was late. Or maybe he's just taking notes. Chances are, though, the ladies (and gents) of Pole Dancing 101 aren't appreciating the hard-core ogling from the other side of the window. Be kind. Now this applies to all areas of the gym: Smile, be courteous, and even try saying "hi." (Using words instead of grunts or whistles is almost always preferable). The gym may not be the happiest place on earth (that's Disney World, right? ), but it can't hurt to try.